Facial Plastic Surgeon and Expert, Dr. Monica Tadros with offices located on Park Avenue in Manhattan and in Bergen County, New Jersey joins eHealth Radio and the Plastic Surgery Information Channel to discuss Rhinoplasty form and function. How can the form and function of a nose be affected by un-treated nasal fractures? Sinus circulation? sleeping and breathing troubles, etc.? What techniques do you specialize in? Why is it important to understand the various areas for finding the proper surgeon? What is the truth about narrow sinus anatomy and migraine headaches: including contact points inside the nose that are known to trigger migraines? Who are the people most affected? What is the vast age range? Why is it important to check for underlying nasal pathology like a deviated septum before rhinoplasty? What is the evolution of rhinoplasty like? Rapid recovery? Dr. Monica Tadros is a distinguished Facial Plastic Surgeon & Reconstructive Surgeon and Educator. She has offices located on Park Avenue in Manhattan and in Bergen County, New Jersey. Dr. Tadros specializes in rhinoplasty, sinus surgery, and plastic surgery in NJ. She is one of a small number of surgeons to attain dual board certification in Otolaryngology-Head & Neck Surgery and Facial Plastic & Reconstructive Surgery and has combined the two specialties in her unique practice of aesthetic medicine. She was appointed the Director of Facial Plastic & Reconstructive Surgery and Asst. Professor of Otolaryngology-Head & Neck Surgery at the prestigious Columbia University in 2006, where she taught many generations of residents and medical students, the art and science of Form and Function and the healing power of compassion. 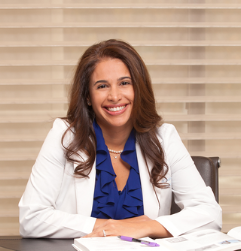 Dr. Tadros has received numerous awards and accolades for her forward thinking, teaching and innovations in Aesthetic Facial Surgery. In the highly evolving field of surgery, Dr. Tadros has pioneered the concept of Aesthetic Facial Surgery, a movement to bridge the gap between Form and Function.